What a difference a flip of a calendar can make. In last weekend's top ten box office charts, only one film had crossed the $50 million mark. On this first weekend of October, one of the new films is likely to hit that figure in three days. One of these days, Disney is going to start checking for ID on their plant tours and finally catch Jeffrey Katzenberg sneaking back in. 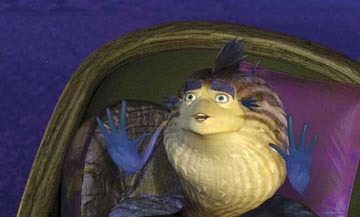 However, DreamWorks Studios would like it known that any resemblance between Shark Tale and Finding Nemo is purely coincidental, just like any resemblances between Shrek and Monsters, Inc. or Antz and A Bug's Life or... OK, so it's easy to knock them for playing "follow the leader", but it really only gets so noticed here because Disney is such an established leader in the division, and animation is such a unique genre among films. DreamWorks can also be credited for finding its own way, realizing that without the Disney name brand, it has to pitch its films at an older audience. Non-Disney animation had such a terrible reputation that reassurances were necessary that there would be something interesting for adults to watch. Perhaps even more than Pixar, these films have made animation acceptable for more than just children's audiences. That idea came to a head this summer as Shrek 2 became the all-time highest-grossing animated film of all time. Memo from DreamWorks to Disney: You got served. They'd be advised to not look too close at this one, as not only does it share an underwater setting with Finding Nemo, but it also appears to borrow heavily from The Brave Little Tailor. A tiny fish named Oscar, voiced by Will Smith, becomes implicated in the death of the Shark Mafia Boss's son and in order to keep from being literally eaten alive, has to keep up the act of the "Sharkslayer". Luckily he has a partner in crime in Lenny (voiced by Jack Black), a shark who wants no part of the Mafia game and is happy to play along with Oscar's plans. As his celebrity grows, his big lie keeps building and he finds himself in hot, uh, water. With a typically star-studded cast for this kind of thing, including Robert DeNiro, Renee Zellweger, Angelina Jolie, and, of all people, Martin Scorsese, Shark Tale should have no trouble breaking out of the doldrums that have gripped the box office in the past few weeks. Don't expect anything like the incredible $100 million plus of Shrek 2, though. The ads, while not without their high spots, generally seem pretty forced and almost entirely dependent on recycled jokes for their effectiveness. As well, unlike most recent computer animated films, it's taking a critical beating. This doesn't spell disaster, as even Ice Age nearly opened to $50 million, and that was about the most generic animated film in history. It's difficult to go wrong in any fashion with a CGI animated film these days and Shark Tale should have no trouble holding this trend of hits, at least on opening weekend. Debuting at 4,016 venues, it should easily set a record for opening weekends in October (currently held by Scary Movie 3 with $48 million) with about $67 million. Undoubtedly inspired by the focus on firefighters after September 11th, Ladder 49 focuses on a single Baltimore firefighter as he is caught in a giant building fire and tells the story of his career in flashback, from his days as a raw rookie. Joaquin Phoenix, fresh off his biggest exposure ever in The Village, plays the lead, with John Travolta here as his captain. Making no bones about being a 'guyjerker', it's definitely got Oscar ambitions with what it feels is lofty subject matter. That doesn't seem probable given its tepid critical reception, but a blend of action and emotion could prove popular with audiences here. The trailer and commercials do a very good job of bringing you into the story of the main characters, which may be enough, although it's still a little hamstrung in the cast department. Despite appearing in two M. Nigh Shyamalan films, Phoenix is still something of a "That Guy" as opposed to a leading man, and John Travolta has done his best to turn himself into box office poison for approximately the 17th time. Other than the obvious Backdraft comparison, the most recent film that this really compares to is Frequency, though obviously without the sci-fi angle. That film only managed $9 million, but had just Dennis Quaid and a pre-Passion Jim Caviezal as its leads. Ladder 49 should do better but won't set the world on fire, starting with about $15 million. The Forgotten was the best opener of a sad month at $21 million, but that's not to say it's destined to drop off the face of the Earth like so many of September's other openers. The only thriller earning significant dollars still in theaters right now, it may be able to make a run at $75 million, as the reception to it has been solid, though not exceptional. The mystery behind the film should be able to keep it strong for another couple of weeks, with this weekend being in the $12-13 million range. The rest of the week's returning films will all be under $4 million for the weekend, though Shaun of the Dead is worth watching for its second weekend result. Still in just 645 venues, this romantic horror comedy has gotten nothing but ecstatic reviews from both critics and the all-important word-of-mouth crowd. Like a couple of recent small-to-medium release films, Garden State and Napoleon Dynamite, Shaun of the Dead is likely to build, or at least hold steady, over the next few weekends. Look for another weekend figure of around $3 million for this film. With the rest of the top ten consisting of slim pickings, focus can shift to the week's limited releases. The widest released of these is Woman, Thou Art Loosed, which, if our Inbox is any evidence, has a huge grassroots movement ready to come out in force for it (P.S. : we're not holding back on you -- we have no idea if it's going to be shown in your city or not. Honest). Based on Bishop T.D. Jakes' self-help novel (and starring him as himself) about his visits to Death Row inmates -- a reversal of Dead Man Walking -- it looks at the damage done by abusive relationships and about the possibility of forgiveness. Though it's debuting in just 408 theaters, this looks to be a film that has flown under the radar. Its potential for this weekend is obviously limited by the number of screenings, but as has been seen several times this year, that's not necessarily going to keep you out of the top ten. I would not be surprised to see this pull a $10,000 plus per venue average, earning the film $4 million and possibly as high as fourth place on the weekend. I Heart Huckabees looks so strange, it's kind of surprising that Charlie Kaufman didn't have a hand in it. Billed as "an existentialist comedy", this latest film from David O. Russell (Three Kings, Flirting With Disaster) seems to defy rational descriptions of its plot. A wonderfully chaotic trailer hints at strange relationships and insanely witty dialogue (or perhaps just insane; it's so hard to tell the difference sometimes). Starring Jude Law, Naomi Watts, Jason Schwartzman, Mark Wahlberg, Dustin Hoffman and Lily Tomlin (these last two as "existential detectives"), this is a film that delights in its own strangeness. Philosophy doesn't always translate well to film, but when done in a humorous manner, it can really strike a chord. Opening on just four screens initially, I Heart Huckabees is looking for big numbers to secure a wider berth, something in the neighborhood of $150 to $250 thousand. This weekend's numbers will go a long way to determining how much of a contender it is for expansion and its Oscar potential.